I am new to Virtual Technologies and want to install Linux Ubuntu distribution for myself for educational purposes. I have downloaded VMWare Workstation Player and Ubuntu .iso file from their website. My PC runs on Windows 10(this is the only OS of the PC). 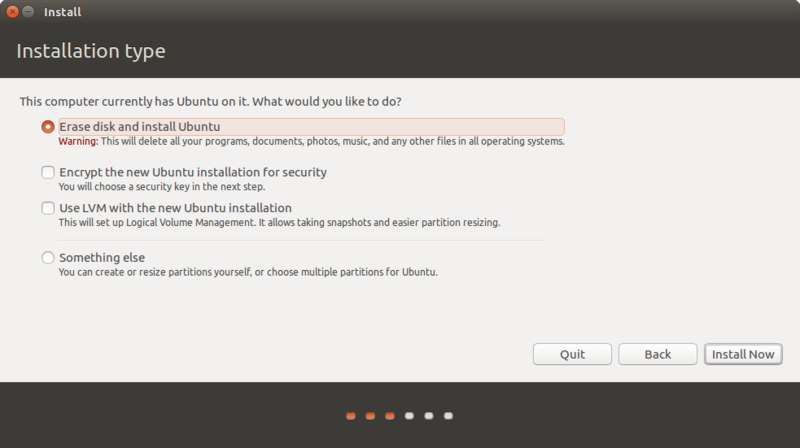 While installing Ubuntu it asks for the installation type, and I am a little bit confused. If I choose 'Erase disk and install Ubuntu, will my PC's all my hard drive be formatted, including files stored in the Windows OS, which is not a VM, or VMs see only the storage allocated for themselves? If I create new partitions via 'Something else' option, will it overwrite my C: and D: disks on Windows OS? Yes... If you choose "Erase disk and install Ubuntu" your whole hard drive will be formatted. "Erase disk and install Ubuntu" means you are authorizing the setup to erase your hard drive completely. It is good to create a partition while you are on Windows OS, and then make use of it through the "Something else" option. I hope this helps you solve your problem. As you can see from the size and labeling the disk it's considering is most certainly too small to be an actual drive in my machine. It's a good idea to check the sizes of drives and partitions on your system and be familiar with them to avoid any mistakes. The size will be equivalent to the size you chose when you created the disk file (virtual disk) that the Virtual Machine actually uses. Another indication that you are installing to a disk file and not a physical drive is that the installer is not providing the option to install alongside your host OS (Windows) as the VM doesn't see it. Not the answer you're looking for? Browse other questions tagged partitioning or ask your own question. what filesystem should i choose for my HDD? Will installing Ubuntu using the “erase entire disk” option remove and erase all currently existing partitions? Is there a way to install Ubuntu next to Windows 10 , using Encryption and LVM without disk erasing? How does Ubuntu partition the disk when we choose “Erase disk and install Ubuntu” during installation? How to clean up my disk partitions?